SEO is getting more and more complicated as more companies realize how beneficial it is to their business. More and more resources are becoming available for every type of industry, there are even Directories for Lawyers to help out law websites now! This means that as I work with clients, I often get asked, Jason, what books should I read on SEO? What do you recommend? I am rather unusual in the SEO industry because I actively want to involve my clients in the SEO learning process… I see my role as much as an SEO teacher as an SEO consultant, whereas many SEO consultants see themselves as the know-it-all-expert and in some terrible cases try to keep their clients in the dark about SEO. Of course, there are books for specific business niches, for a law firm you should visit https://theonlineadvertisingguide.com/early-train/top-5-marketing-mistakes-your-law-firm-is-probably-committing/, whereas for the healthcare industry for example you can find a healthcare marketing book. Educate thyself! Here are my favorite TOP TEN books on SEO. Or, if not books, things to read! Be sure to take my Free Top Ten SEO Tools Webinar! Google’s own guide. Albeit rather hidden, and only focuses on on page. But it’s free and it’s by Google. Get it, download it, read it. Also functions as a sleep aid! This is my own book. My goals are to help the average business person or marketer with a simple, step-by-step guide to SEO. The 2012 edition includes free access to my SEO Toolbook, with links to over 100 amazing free SEO tools available on the Internet. I love dummies! This is one of the best dummies books, and Peter Kent does a great job of explaining the step-by-step things to do for successful SEO. Not the best written guide, especially compared with Google’s… But still worth while. Especially Chapter 7 on links. Google’s lack of discussion of links is conspicuous by its absence, so be sure to check out Chapter 7 here. A big book, waaaaaaaaayyyyyyy toooooooooo long. But still crammed packed with interesting information and Bruce Clay is the grandpappy of SEO teachers, so an obligatory shout out. Can’t go to sleep? Although it does have useful information, it sadly needed a sharp editor. Doubles or triples as a sleep aid, but still worth the purchase and read. Jennifer Grappone and Gradiva Couzin have written a solid, introductory text to Search Engine Optimization. The idea of an ‘hour a day’ is critical – SEO is like physical fitness: slow and steady wins the race. Google+ is the new kid on the social media and SEO (Search Engine Optimization) block. This isn’t the best book, ever, but it is a good book on a critical SEO subject: Google+. Looking forward in 2012, we all need to get on Google+ and start plussing! Google clearly is intertwining SEO with Google+ and social search. Lists and lists and lists of great things to do to improve your rank on Google and Bing. SEO is all about details, and a book of lists makes my list of the top ten SEO books. Why? Because the devil is in the detail. This book isn’t the best written book, but it has TONS of great ideas. Danny Dover has written a book on SEO, more for experts than for the average business owner. So I recommend that you get this book, only after you have read and digested the introductory texts like my own or Peter Kent’s. At that point, you are ready for some esoterica, and Dover’s book is a great place to start moving up from practitioner to expert. Free is a critical part of successful Internet marketing. It’s not enough to do great SEO, it’s not enough to worship the Gods of search engine optimization. It’s not enough just to get clicks; you need to get actions (registrations, purchases). Start with something free – a free download, free consult, free e-book. Read my Top Ten Best SEO Books Ever list on Amazon.com! We are all publishers. Larry Dignan gets this, and explains in this wonderful Amazon Kindle Single how the publishing industry is adapting to the digital revolution. What’s cool is that even if you are a small business, this book can help you understand the SEO revolution, the review revolution, and how critical it is to think not just about content but about publicity. An excellent, fun read for just about anyone in small business (Internet) marketing! There are few books out there, as most of readers and critics know, to which I give five stars. 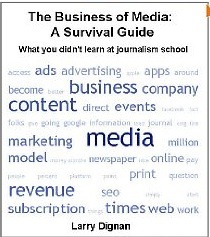 The Business of Media – A Survival Guide, however, is one such book. What’s more – it’s deserving of five stars not just for its target audience (journalists, publishers, media types) but for small businesses as well. Why? Because Larry Dignan “gets it.” He gets one of the truisms of our time: everyone is a publisher. The New York Times is a publisher, Geico is a publisher, Gail Collins is a publisher, Seth Godin is a publisher, Sweet Teez with its amazing candies in Larchmont, NY, is a publisher, and you as a writer, poet, clown-for-hire, or whatever, you – too- are a publisher. What’s more you are a writer, an editor, and a producer. Dignan “gets it,” and he explains some of the pain (and opportunities) of today’s Internet and social media economy. The book is relevant not just to traditional publishers but to everyone who has a small business, works as a marketer, or seeks to cultivate publicity. Second point, this book isn’t all negative. It’s not a rant or a rave, a Luddite rebellion against an unstoppable Internet future. Says Larry: it’s an “exciting or absolutely frightening time,” depending on where you sit in the media ecosystem (large publisher with fixed costs or small new Mommy blogger with a successful blog), and depending on whether you are the small business that “gets it” (the restaurant that understands how SEO, Google Places, and Yelp are critical or the restaurant that still shovels money at the Yellow Pages and wonders “what happened?”). It’s an incredibly positive time for you to take advertising into your own hands via SEO, Social Media, and AdWords! This Kindle single is a think piece, one of the best examples I have found to date of an enjoyable, thought-provoking read. We are all publishers, and Dignan conveys how this revolution is rocking media, and journalism, and as I hope I have pointed out is and will continue to rock the world of small businesses. All small businesses are publishers now – just some “get it” and some “do not.” Which are you?